Skoda has huge plans for 2017. They have a long list of models that they will be launching in the country this year. 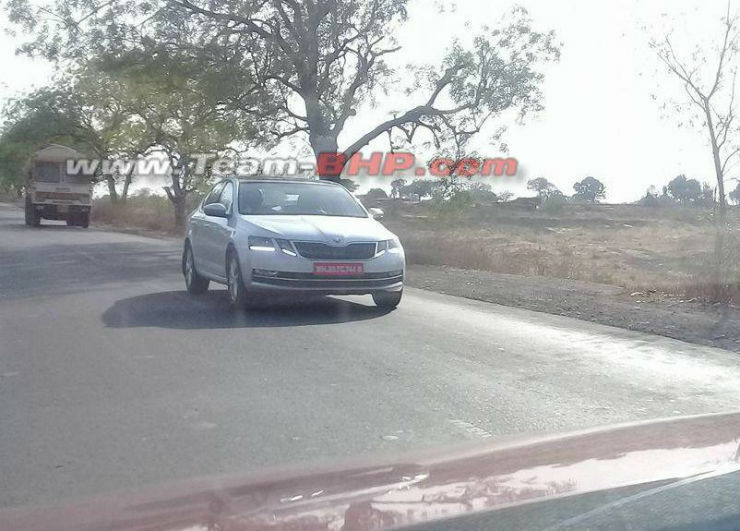 Among them is the all-new Octavia, which got its facelift late last year. The vehicle was spotted on Indian roads for the first time. First thing, let’s clear out the fact that this is just a minor facelift and not a major update. So things have mainly been changed in the looks department up front. Where the current Octavia gets a single headlamp unit, this one features a split unit, like on the previous gen Mercedes vehicles. Both the lamps feature LED DRLs at the bottom and like the Superb, also feature the 3D effect on the light. The grill has also been changed and now sports a split in the middle. There is a new bumper on offer with a smaller fog lamp housing as opposed to the one that is currently present in the Indian variant. The bonnet too receives minor updates with 2 strong crease lines coming around the bonnet edge. The side profile remains the same and at the back too, the only change is in the tail lamp cluster, that too a very minor change which most people might just miss. On the inside the changes are very minimal. People familiar with the Octavia will notice that there is an all new 9.2″ touch screen system as opposed to the smaller one that we get currently. The car also features ambient lighting, something that has been introduced on the new Superb as well. Under the hood, we expect Skoda to continue with the 1.4 liter TSI engine, which is currently on offer. What the company will do is add a DSG to that as well. Sad news for enthusiasts since the company will most likely kill the 1.8 liter TSI engine that is currently on offer, like Audi did with the A3 and A4. The same 2.0 liter TDI engine will be on offer though, in both manaul and automatic guise. While the 1.4 is disappointing, the company will bring in the 2.0 liter TSI in the vRS, which gives us a huge reason to be happy. The company will launch the car in the next few months, ahead of the launch of the new vRS.